So far Thomas has created 292 blog entries. More Rain To Come For Inland QLD! 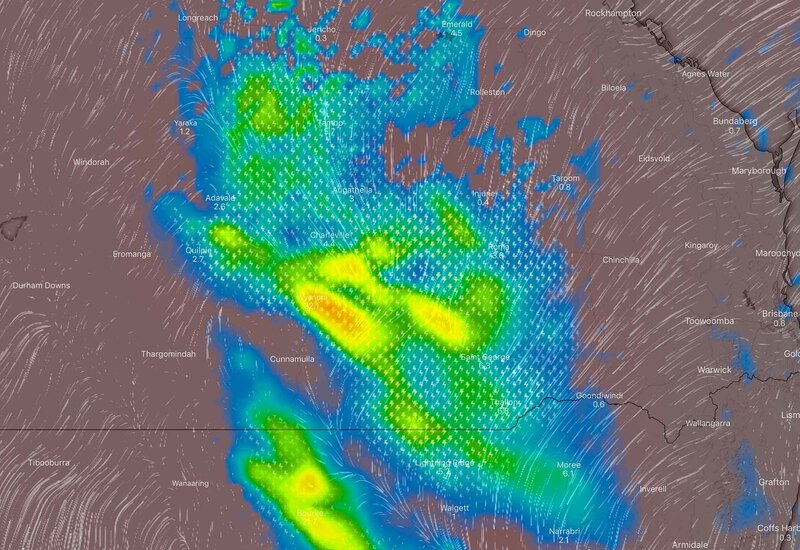 While many areas have benefited from Ex-TC Trevor and the trough associated with the system, there is an area over the Warrego and Maranoa region (South of Charleville to Toowoomba) that has greatly missed out. 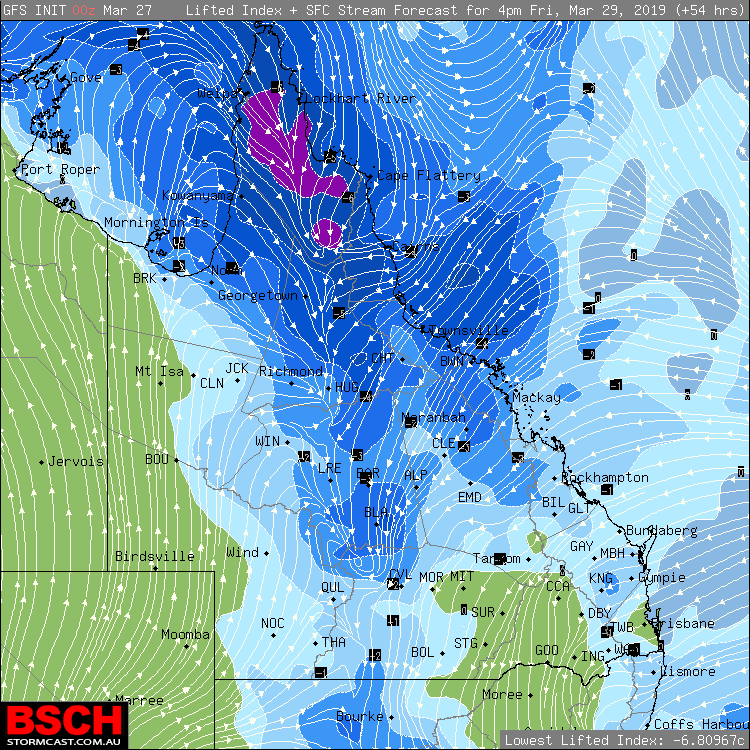 Above image showing the 7pm rain simulation for Southern QLD via Windy. Ex-TC Trevor has pretty much followed the script with models. Large areas of Western, Central West, South West and South East QLD have seen beneficial rain. That was what was always forecast. The Darling Downs has seen patchy good rain which was forecast. The Central Highlands have some potential coming up. Its been Southern Inland QLD (Warrego & Maranoa South of Roma to Charleville) and the Southern Darling Downs / Granite Belt which were always on the lighter side for rainfall from this system. Well there is hope on Friday. A new surface trough is forecast to develop and feed off lingering moisture from the remnants of Trevor. This is likely to combine with some upper support further South to generate weak instability over Southern QLD, moderate to strong instability over Central and Northern Inland areas into the Peninsula. This trough is LIKELY to generate a band of showers, rain areas and storms during the day which will slowly progress East. While Central and Southern areas (Longreach, Blackall, Winton, Charleville) are likely to benefit from some follow up rain after a 1 day reprieve. The focus will be on Southern areas which could see 15-30mm likely (in the yellow shaded areas) and locally higher falls of up to 50mm under storms. Better falls are expected up until Central QLD where 25-50mm is likely and isolated higher falls under storms. But for an area that missed out, 15-30mm could be just enough to make this a half reasonable system in the end. The Quilpie, Bollon, Thargomindah pocket may miss out on a bit with activity developing there, but St George, Miles, Goondiwindi, Surat and surrounds should benefit. The Granite Belt could miss out a little bit, but across Friday and Saturday some half decent falls are possible there – especially with storms (it will be a 2 day combo, not a 1 day wonder). Its been a very long Summer – even for SEQLD standards, but some actual cooling is just around the corner now thanks to Ex-TC Trevor! Above image via OCF / BSCH – Maximums for Wednesday. This Summer we’ve seen record breaking low rainfall across SEQLD in January. Gatton broke its record for consecutive 35ºc days (which was only broken for like 2 days before temperatures went back up). 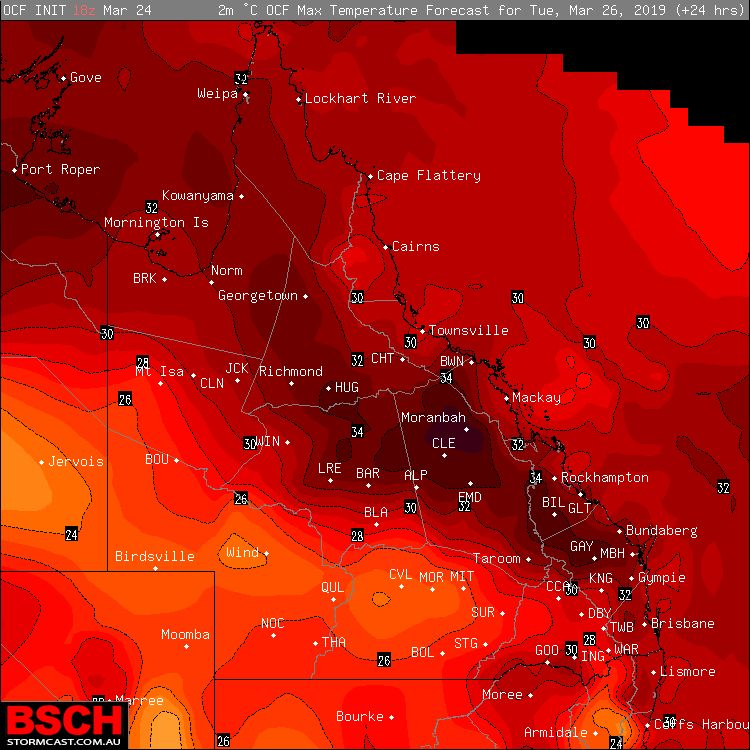 Ipswich and Brisbane both slaughtered their old records for consecutive 30ºc days – which lasted about 1 day for both. Many other areas have seen ridiculously hot weather which includes Beaudesert having a state-high anomaly of +4.1ºc above average for February which has also trickled into March with many areas on track for their hottest March in up to 70 years! On Wednesday though, a trough associated with Trevor is expected to extend across Southern Inland and reach South East QLD. This trough will be largely responsible for drawing in a lot of moisture, leading to widespread rain areas which are likely to last into Thursday. How much rain is falling?? We will get to that. The combination of widespread prolonged rain and thick cloud coverage will allow temperatures to remain in the low to mid 20’s for most of South East QLD. It could be even colder on the Ranges where Stanthorpe and Toowoomba are going for just 20ºc, maybe it could even stay in the teens! Unfortunately the cooling is only short lived, with heat returning on Friday as conditions clear. But its likely to be a pleasant 48-72 hours for many. 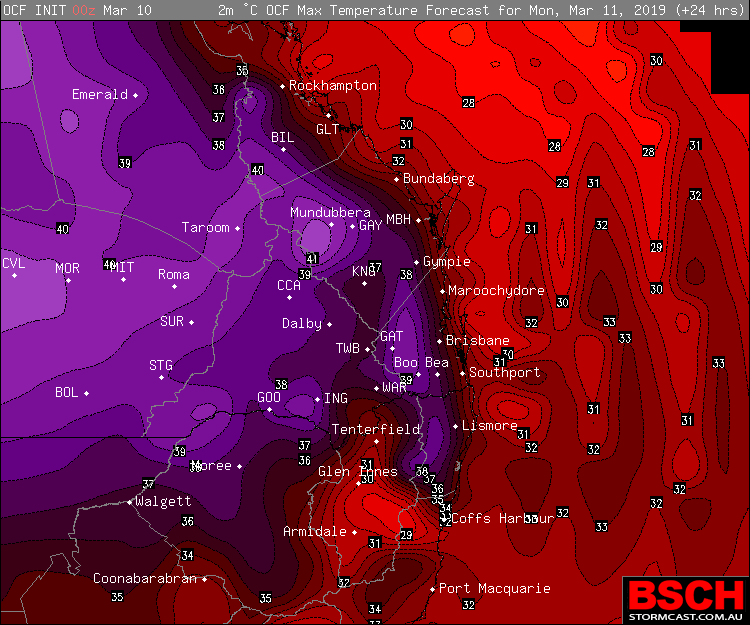 WELL Below Average Temperatures Forecast For Large Parts of QLD! For the first time in a long time, large parts of QLD are expected to be below average for temperatures! Its been an exceptionally prolonged Summer (more than usual) across the State with only very momentary cooling periods (if you can even call them that) but Ex-TC Trevor is going to benefit us in more ways than one. 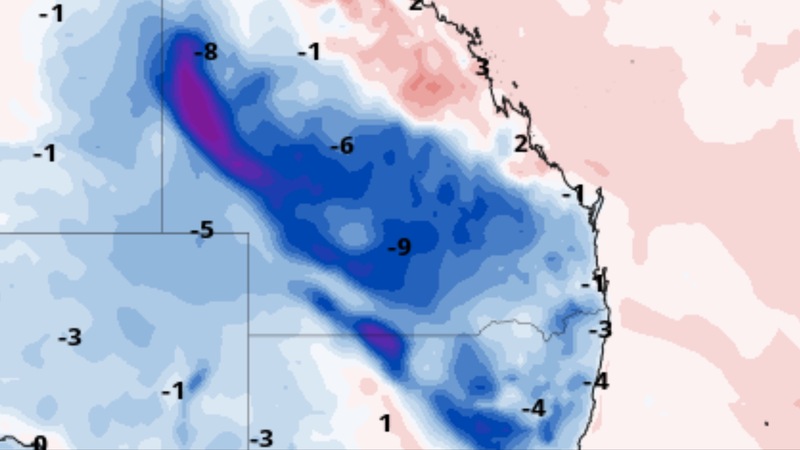 Above image – Temperature anomalies (below is below average) across QLD on Wednesday. 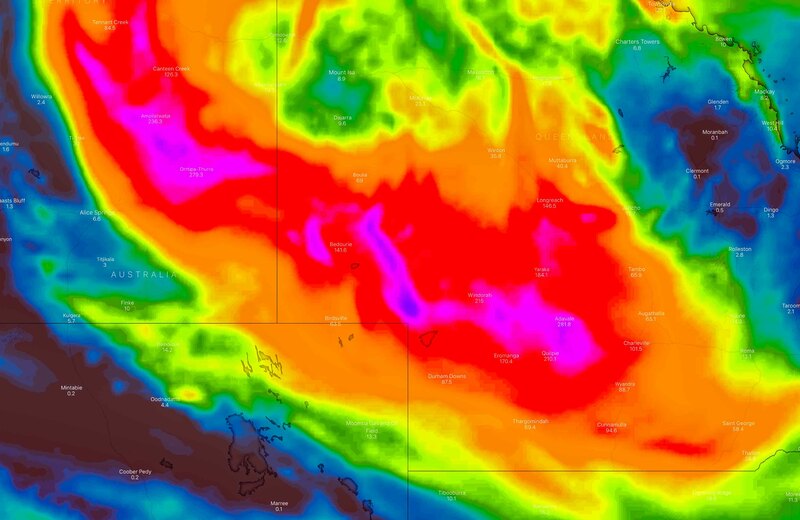 During Tuesday and Wednesday in particular, a very large portion of Western, South West, Central West, Southern Inland and eventually spreading into South East areas on Wednesday and Thursday, is expected to be below average for March temperatures – with some areas being up to 15ºc below average in Western QLD. Thins is all being brought on by Ex-TC Trevor and a trough associated with Trevor which is forecast to extend across Southern and South East QLD eventually. 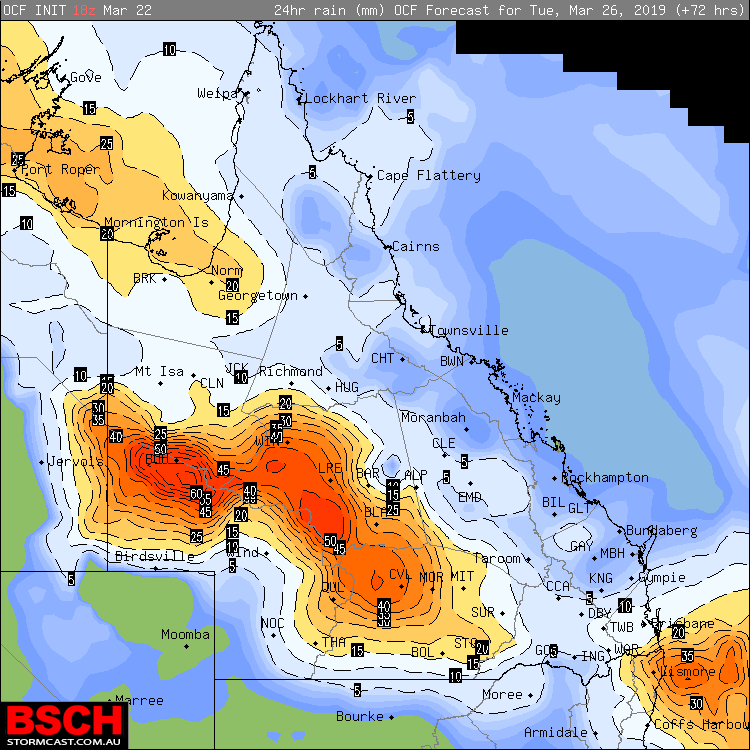 The combination of Trevor and the trough will bring widespread significant rainfall to Inland areas of QLD with very good rainfall over Southern and South East QLD – we will get to that in other blogs. Aside from the rainfall though, extensive cloud coverage will prevent any heating from occurring. This is likely to produce widespread maximums across Western, South West and Southern QLD in the low to mid 20’s across both Tuesday and Wednesday which should gradually spread further East on Wednesday to cover Southern Inland, South East and Central QLD as well. Birdsville averages 36ºc for March. On Tuesday, the town is going for just 24ºc! Bedourie averages 36ºc as well, and is expecting a top of just 25ºc on Tuesday as well, followed by 26ºc on Wednesday. Charleville has spent 121 of the past 122 days above 30ºc (January 31st being the lone day below) – Tuesday it’ll be just 24 and even colder on Wednesday. 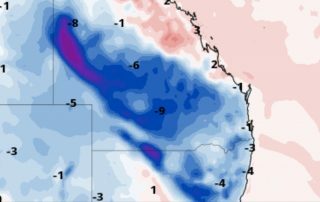 After such a relentless and hot Summer across the majority of the State (the only real cold snap was during the February floods in Northern QLD), its good to have just a few days of relief – unfortunately it will only be a few days (3 max for most places). Even then, its good to see even a glimmer of hope that more prolonged cooling could be just around the corner. Models are continuing to indicate a very severe / dangerous weather event for the Eastern NT, Western and South West QLD, possibly extending into Central QLD courtesy of Ex-TC Trevor and its moments. 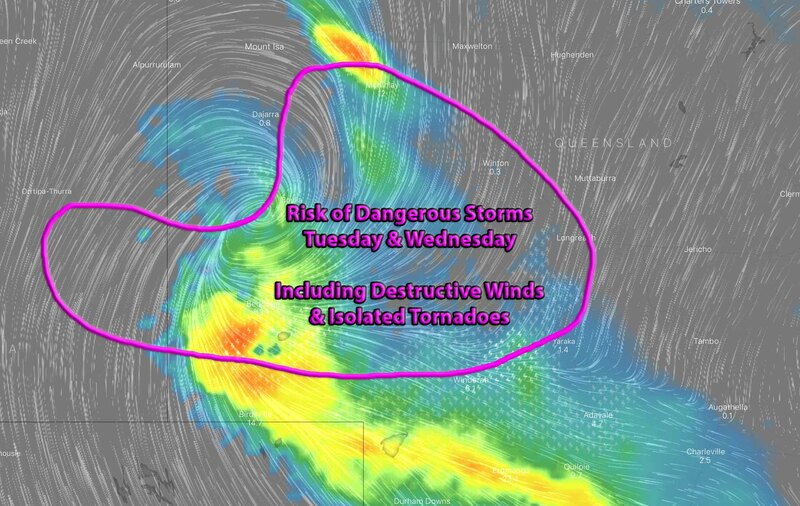 Above image via Windy showing rain / storm overlay for Tuesday with a threat area circled for Tuesday and Wednesday. Its not often we see this – Especially for Western QLD and the Eastern NT, but there is the potential for a very significant weather event over the next few days which ill include an extreme threat of major flooding along with an elevated risk of dangerous thunderstorms containing destructive winds and tornadoes. This is all being brought about by Ex-TC Trevor which is predicted by global models to move through the Eastern NT and into Western / South West QLD before shifting towards Central Inland QLD over the period of Monday into into Wednesday night. The main focus will be over the heavy rain which we have blogged already HERE. This heavy rain has the potential to produce widespread major flooding across a large portion of Eastern NT, Western, South West and potentially Southern Inland QLD with widespread falls of 50-150mm and scattered falls of up to 300mm! There is an increased risk that river catchments impacted by the February flooding may be impacted again, which will only speed up the flood process. While that will be the obvious concern. There will be another concern for dangerous thunderstorms and an elevated risk of tornadoes. Its understandable for people to not quite grasp this, but tropical cyclones are quite prone to producing waterspouts (over water) and tornadoes (over land). This all comes about from the system’s drawing in very high moisture levels and combing that with increased wind shear surrounding the system. This then leads to any thunderstorms in the near vicinity of the system or over the Eastern periphery usually, starting to rotate. The strong wind shear allows the rotation to tighten and waterspouts / tornadoes develop. 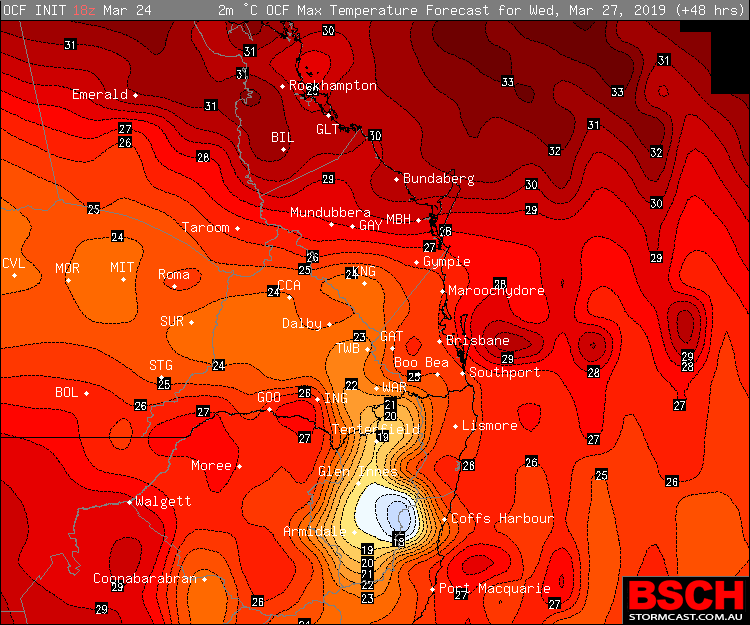 Tuesday: Instability is forecast to increase across Western QLD, East and South East of Ex-TC Trevor. This will combine with a trough extending East from Trevor to produce increase wind shear over the Eastern, Southern and South West peripheries of the system. 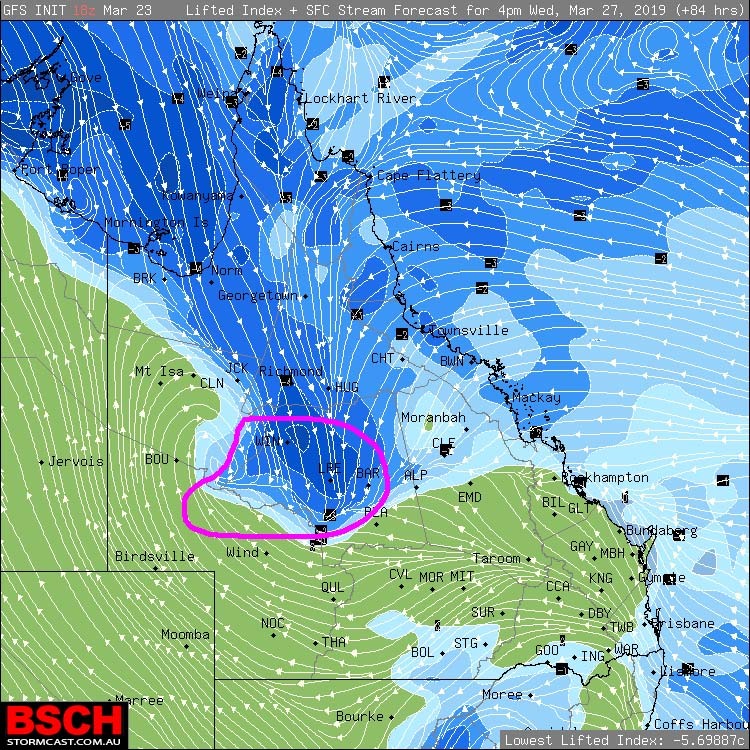 It will be this area (circled in pink) that has the highest risk of “any” thunderstorms producing destructive winds or tornadoes. Wednesday: The threat will shift East with the system. Ex-TC Trevor is forecast to move over Western QLD which will mean instability will extend across Northern and Central Inland QLD. The trough will remain East of the system and continue to provide a localised area of enhanced destructive wind / tornado potential. There is a very high risk that observation stations across Inland QLD won’t record 125km/h+ winds, and there is an even higher chance that a tornado won’t be spotted due to the sparsely populated and largely inaccessible area that the heightened risk lies over. That doesn’t take away from the fact that the potential is still there and there is every risk that a poor farmer or property owner could be under it. The easiest way to detect these dangerous storms will be with water vapour imagery and lightning overlay. Its around this time of year that we see the first signs of Winter approaching South East AUS. While Summer snow isn’t exactly uncommon across TAS, there is a different approach to the season’s change when its associated with the first main cold front. That cold front is forecast to sweep across Tasmania, Victoria and Southern NSW over the next 24 hours bringing with it rain, storms and snow. During Sunday, the focus of weather will be over VIC and Southern NSW where very warm to hot conditions ahead of the cold front fuel the heat required for some thunderstorms to develop across the region. These storms may be late developers due to the timing of the front and may also be heavily focused over South West / Southern Inland NSW and Western VIC. Due to their speed, not a lot of rain may come out of them – but it could be another dust kicker for rural areas from the winds. Overnight Sunday into Monday, the cold airmass trailing in behind the front is expected to start to impact Tasmania and Western VIC, reaching Eastern areas of both States comes Monday morning. 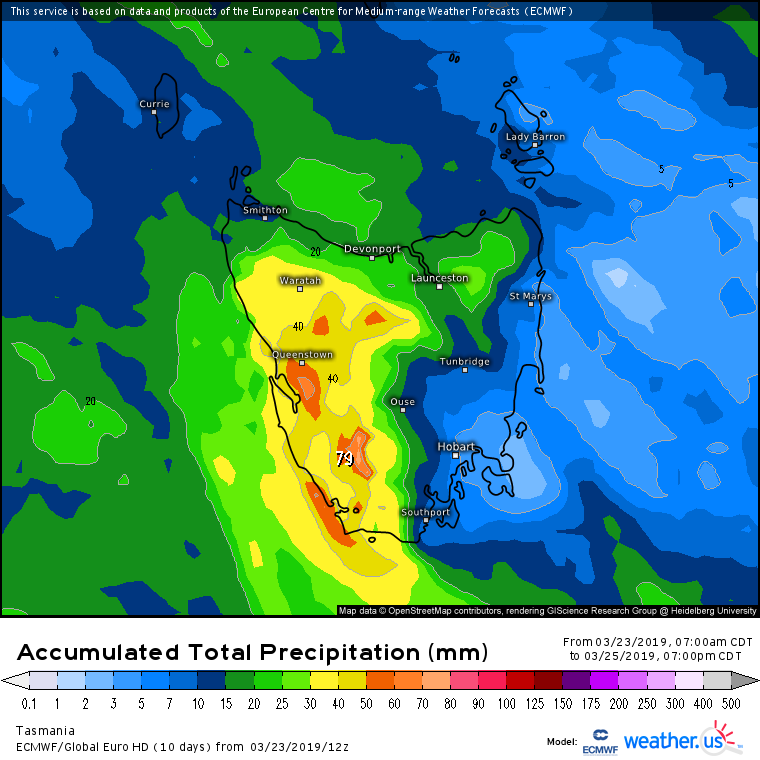 This will allow showers and rain areas to develop across Western TAS where a much needed 25-50mm is expected along with locally higher falls being possible. Unfortunately for VIC, a lot of the rain will reside over the Snowy Mountains / VIC Alps where 30-70mm is expected. 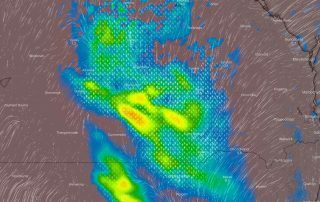 The cold air mass will also combine with the increased moisture to proceed the right ingredients for snow flurries across the Tasmanian Highlands where 10-15cm is forecast to fall. 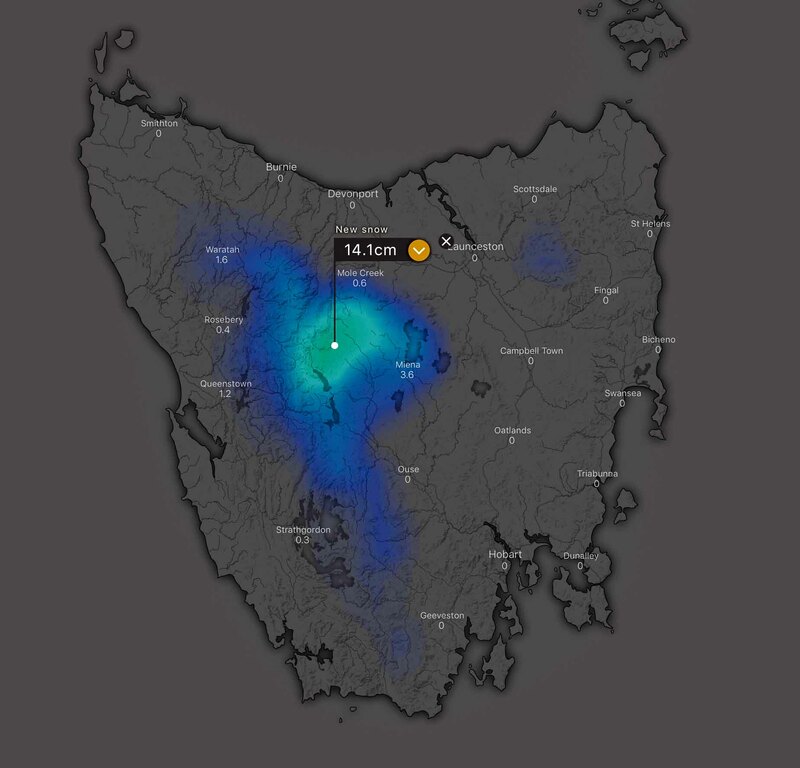 Snow should fall down to around 700-800m across TAS. Across VIC, the snow potential is almost non-existent but it wouldn’t be a total shock to see some unsettled or very light flurries over Mt Hotham or Mt Buller. The cold air mass will also drop temperatures by about 10-14ºc over VIC where most areas will barely get out of the teens on Monday compared to almost 30-33ºc on Sunday. 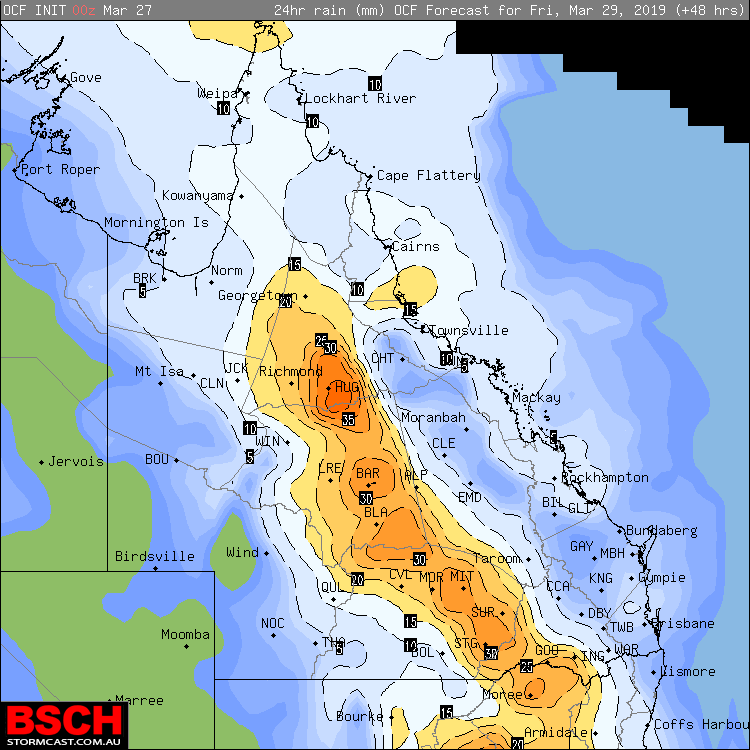 Trevor To Bring Widespread Heavy Rain for South West QLD & South East NT! 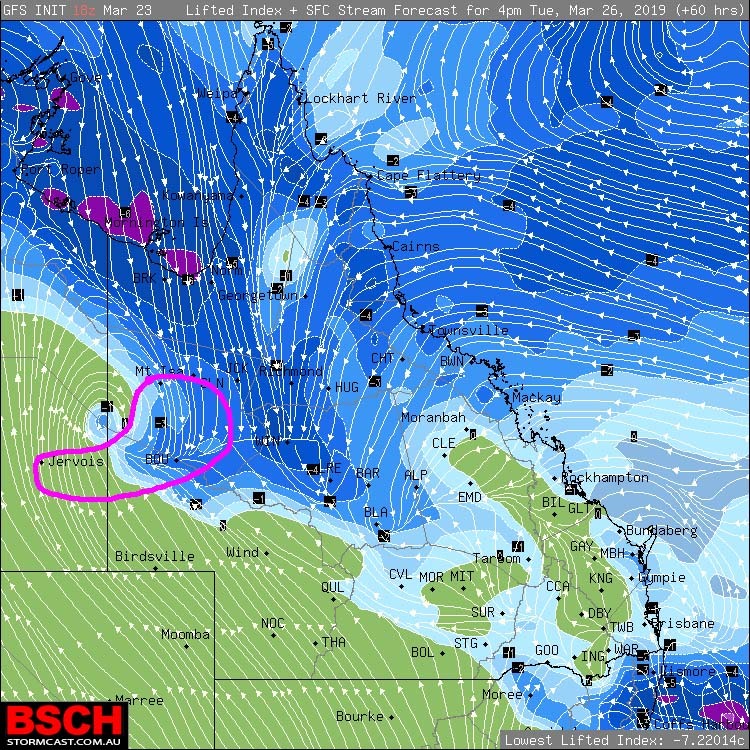 While there is an obvious and much required focus around the catastrophic potential of Trevor’s landfall over the Southern / South West Gulf of Carpentaria. 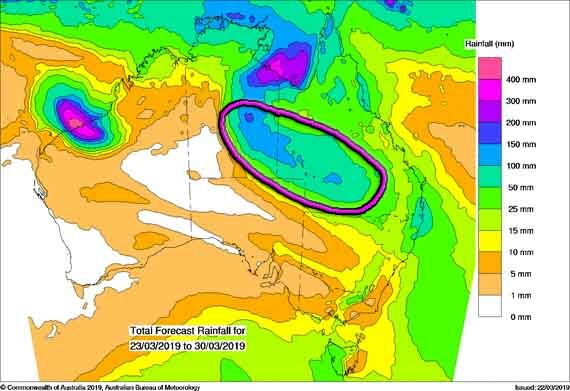 The futuristic potential of the system is very promising with widespread significant rainfall forecast for heavily drought stricken parts of South East NT and South West / Southern QLD. Above image via rainfall accumulation for the next 5 days. Trevor is forecast to move South West into the Central NT near Elliott and then South towards Tennant Creek. During this time the system is likely to weaken below cyclone thresholds, but still retain some very strong to possibly damaging winds. 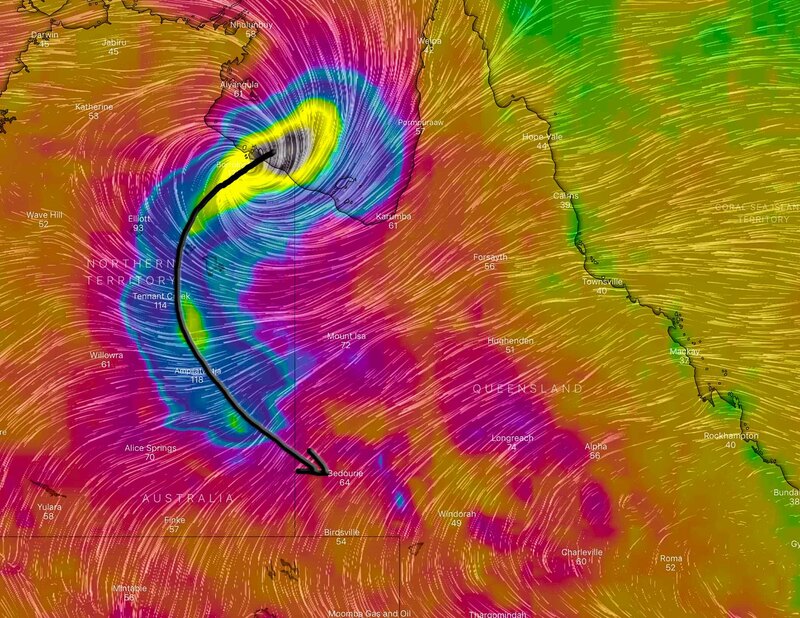 From Tennant Creek, the system is expected to track South East towards South East NT and then possibly entering South West QLD – this overall tracking doesn’t really alter too much in the forests though due to an associated trough with the system extending across South West and Southern Inland QLD. What all of this will do is draw in excessive amounts of moisture from the North and North East (tropical and monsoon moisture) which will converge around Ex-TC Trevor and lead to the development of widespread rain areas and storms. 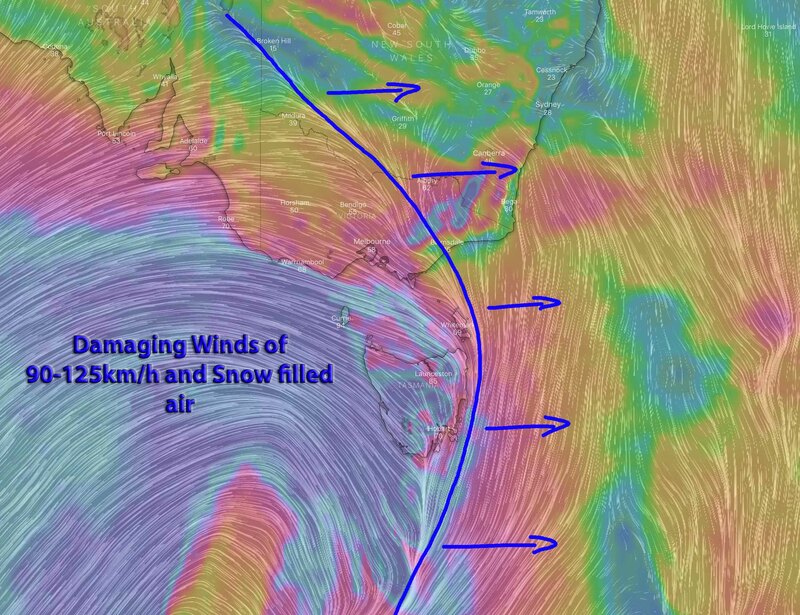 Wind accumulation via Windy showing the South and South East track of Trevor over the next 5 day. Across South East NT and South West QLD – widespread falls of 50-100mm are highly likely. This will include the towns of Birdsville, Windorah, Adavale, Quilpie, Jundah, Thargomindah, Charleville, Durham Downs, Ballera, Boulia, Bedourie, Jervois, Canteen Creek, Ali Curung and surrounding areas. Further scattered to widespread falls in a band surrounding the actual track of the system and associated trough will range from 100-200mm with isolated falls of 300mm+ being possible. BOM 8 day rainfall showing widespread 50-200mm across South West & Southern QLD + South East NT. This kind of rainfall will have the potential to produce widespread flooding across both regions with the potential of some localised 24 hour or monthly record’s being challenged. This rainfall will potentially isolated and inundate communities across both South West QLD and South East NT for a number of days if not more than a week given the widespread nature of rain and extensive amount of time it typically takes to recede. This rainfall will also eventually flow into Lake Eyre. This definitely has the potential to be a very significant rain event across both areas that we haven’t seen since at least 2011, if not longer. There is further potential for heavy rain beyond the current 5 day outlook across Southern and South East QLD, however this potential is still unsettled for now – further updates will apply for this in the coming days. OCF Forecast Rainfall for Tuesday ALONE. Some of these totals could be doubled for the day given the nature of the setup. 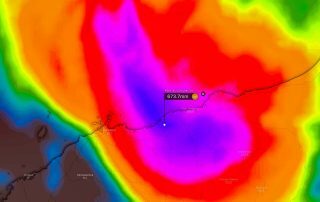 Up To 2 Years Worth Of Rain To Flood The Pilbara In 3 days! Severe Tropical Cyclone Veronica is expected to be a little different from typical WA systems. Normal WA tropical cyclones – while they produce heavy rain, its not excessive like we see in Queensland or the Northern Territory. Veronica due to her movements is expected to be very different, dumping up to between 1 and 2 years worth of rain in just 3 days! 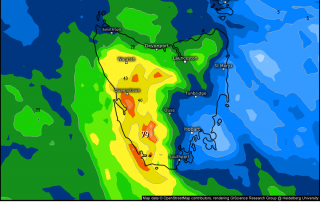 Above image via Windy showing the EC 3 day rainfall accumulations. 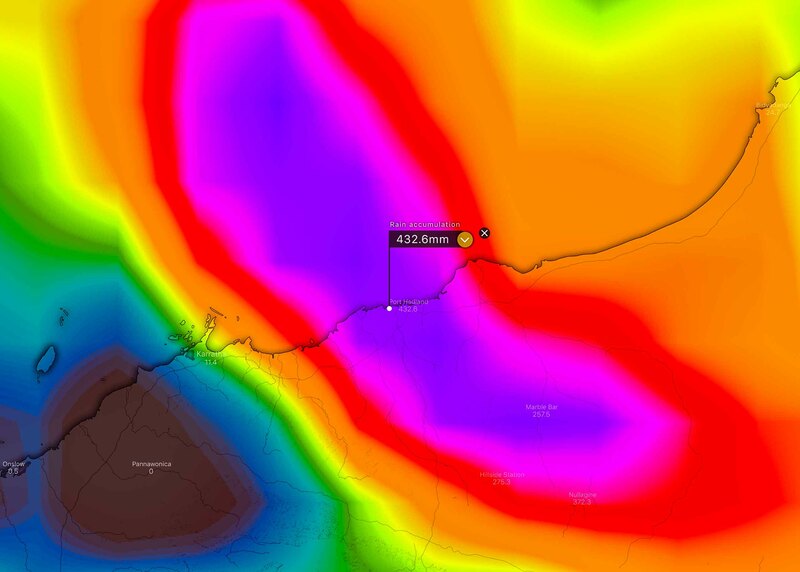 A “normal” WA tropical cyclone will produce around 100mm of rain usually across the Pilbara. Some areas may see a little more, with isolated 200-300mm totals… but the “heavy’ WA falls are usually reserved for the Kimberley. 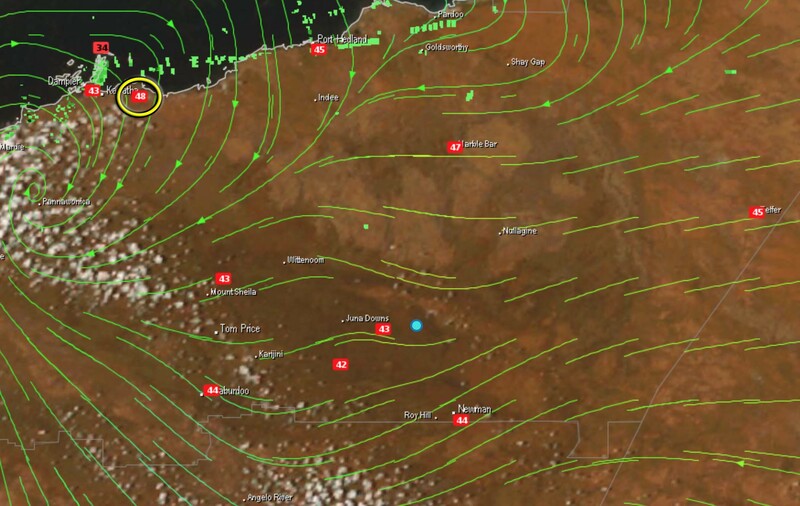 As Severe TC Veronica approaches the Pilbara Coast and makes landfall during Sunday, the system is expected to interact with a complex synoptic pattern which will cause it to not quite stall, but more of less move around in circles on itself. Global forecast models have been in full agreement about this for a number of days, with the system bouncing anywhere from Port Hedland or North of Port Hedland down to Dampier an Karratha and Inland to Wittenoom over a 3 day period. This will lead to excessive rainfall accumulating over the region. There is some variance in model data as to where the absolute highest falls will be. The GFS American Model is plastering the Port Hedland region with over 400mm of rain. The European Model is plastering the Coast between Karratha and Port Hedland with up to 600-700mm and rain and a large area of 300mm+. Either scenario gives the same results. So as you can see, if GFS comes off – then some areas will likely receive over a years worth of rain in 3 days. If EC comes off, then some areas could see 2 years worth of rain! 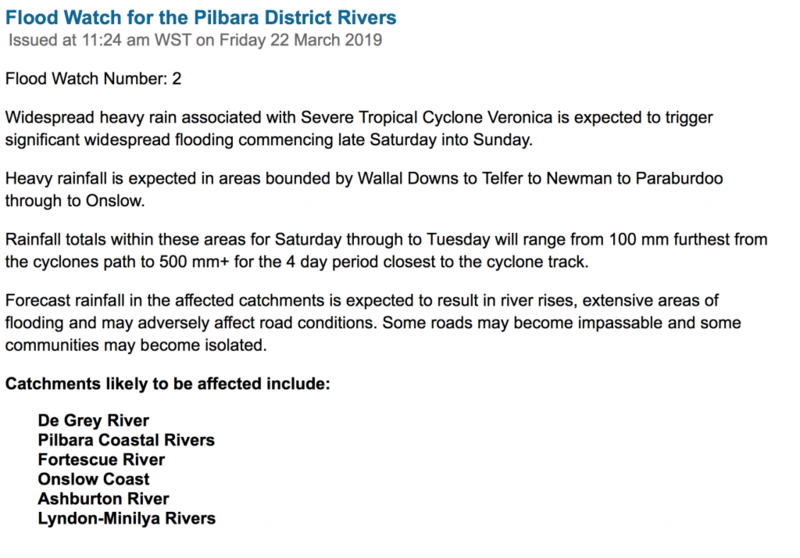 The end result will likely be widespread excessive major flooding that cuts many towns off for weeks due to the landscape layout and the way the water flows across the Pilbara. The flat, hardened earth will mean very little of it soaks into the ground but instead becomes almost instant flooding. This along with the other threats from Veronica will lead to some towns being isolated for more than a week and possibly much longer than that. Note: BOM already have a Flood Watch for the area, stating falls of 500mm+ are expected in isolated areas. The Pilbara has copped some absolute furnace-like heat today with temperatures scorching to those normally experienced in the peak of Summer! This was all brought on by a surface trough located near the Pilbara Coast drawing in hot, dry, desert heat across the region for an extensive period of time which allowed temperatures to continuously scorch. Roebourne was the pick of the bunch though, breaking the Australian March Record of 47.8ºc set back in 2007 and 1998! 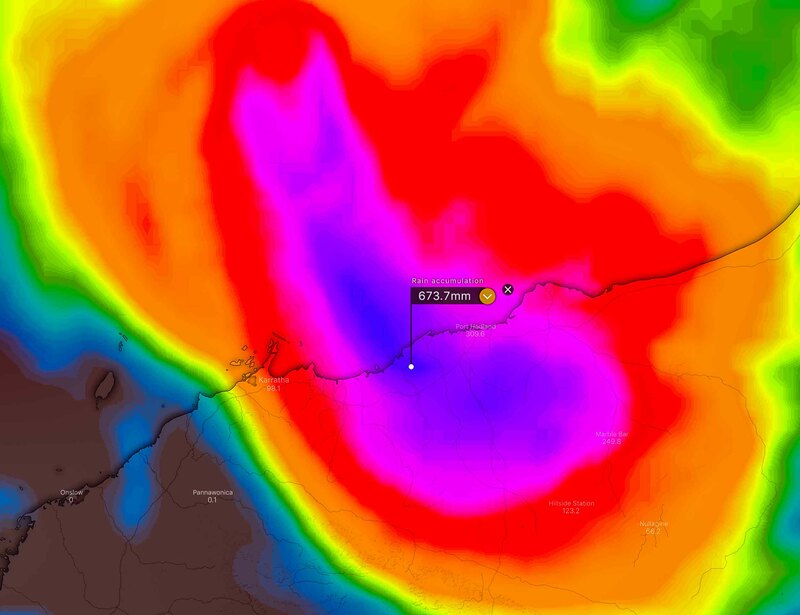 Above image via Weatherzone, the yellow circle shows the 48ºc captured at Roebourne during the afternoon. 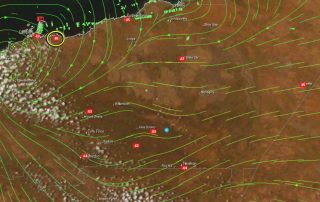 • Roebourne 48.1ºc – New State & Australian Record! 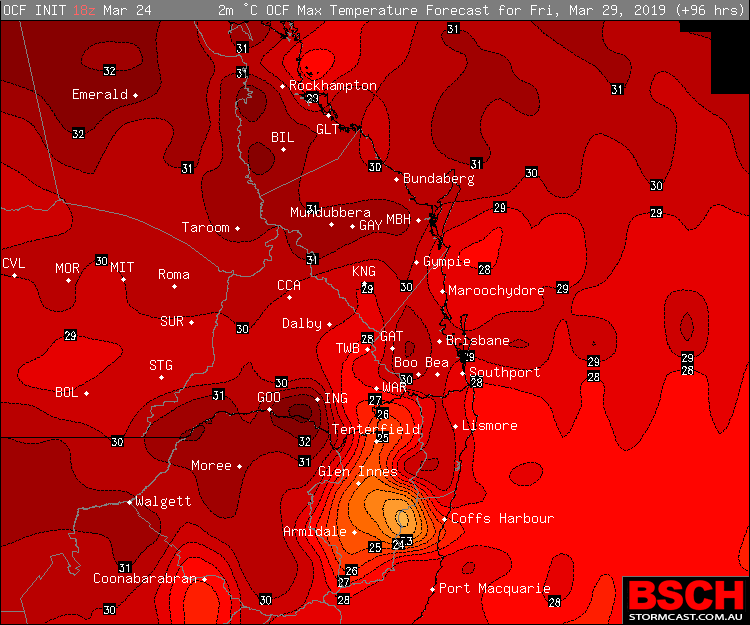 • 4 of the 12 recordings of 47ºc+ in March for Western Australia have occurred today. • Roebourne has broken its March record of 47.8ºc with records dating back to 1957. Roebourne has also broken the State and Australian record of 47.8ºc set by both Carnarvon, WA in 2007 & Roebourne itself in 1998! • Marble Bar (118), Port Headland (109) both have records dating back over 100 years, Onslow over 75 years, Telfer over 50 years, Newman and Warburton around the 40-45 year mark. • A side note worth mentioning, Marble Bar has now officially recorded 107 consecutive days above 100ºF (37.8ºc). Their world record of 160 consecutive days will take some beating, but another 7 days above 100ºF are expected to stretch the run to 114+ days and it wouldn’t be a shock to see the 122 day run a few years ago get a run for its money. 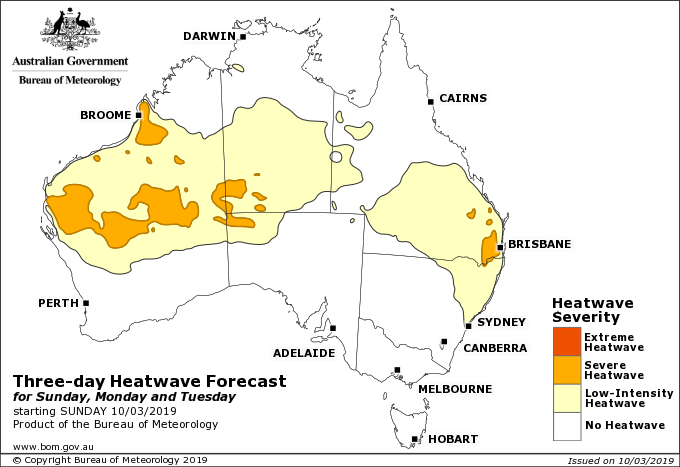 Across the next 3 days or so, the South East quarter of QLD is expect to endure a “potentially” record breaking heatwave. 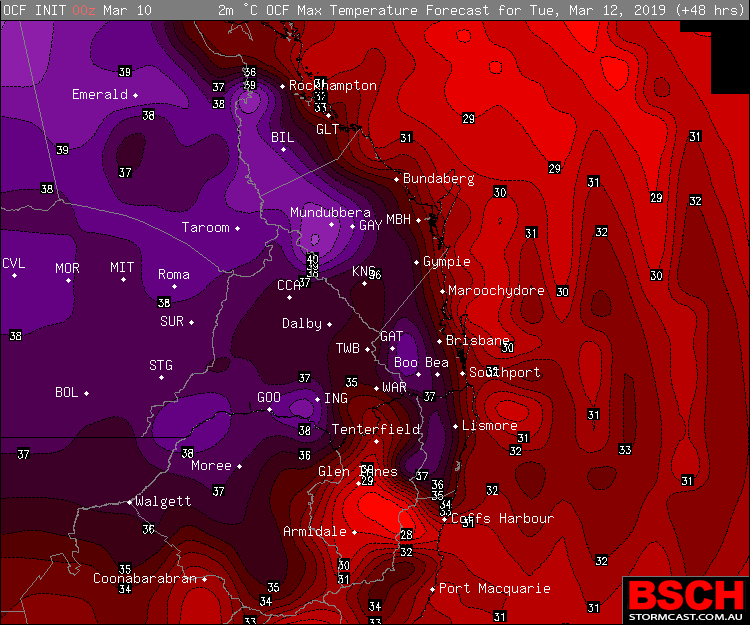 Above image – Maximums for South Eastern QLD via OCF for Monday. It gets hot in March, but going off the data we have available to us – it doesn’t get this hot. A surface trough is expected to move into the region during Monday, lasting until Wednesday. This trough is expected to draw in hot Westerly winds into the back of it which will combine with very warm and humid Northerly winds. 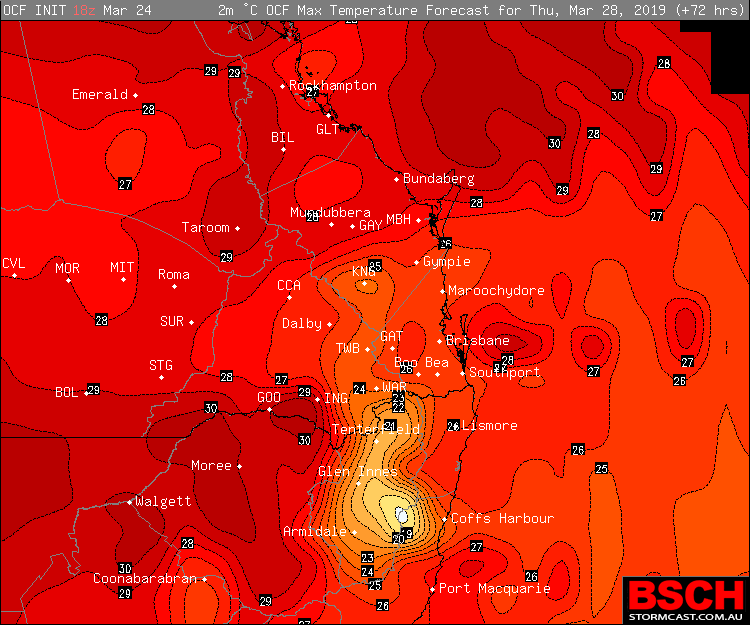 This combination along with a warming air mass is expected to provide the perfect setup for temperatures to scorch into the mid to high 30’s for 3 consecutive days across South East QLD, with some isolated areas pushing 40ºc on Monday. You have to remember that this is March, so we don’t see this kind of heating very often, if at all, across the region – so this will likely be classed as a ‘Severe’ strength heatwave. 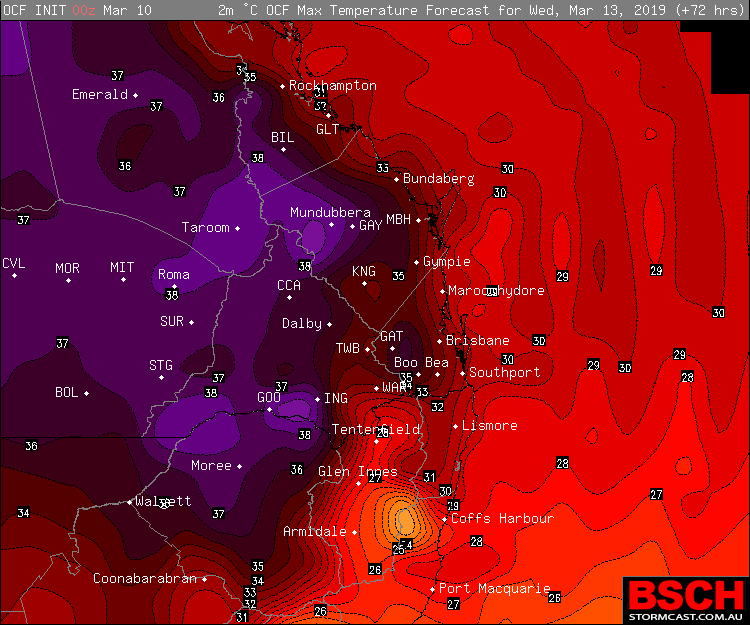 It would be right to assume we (South East QLDers) get hot in March. Its typically a very warm and normally quite humid month. However, data available to us, suggests its doesn’t get this hot. 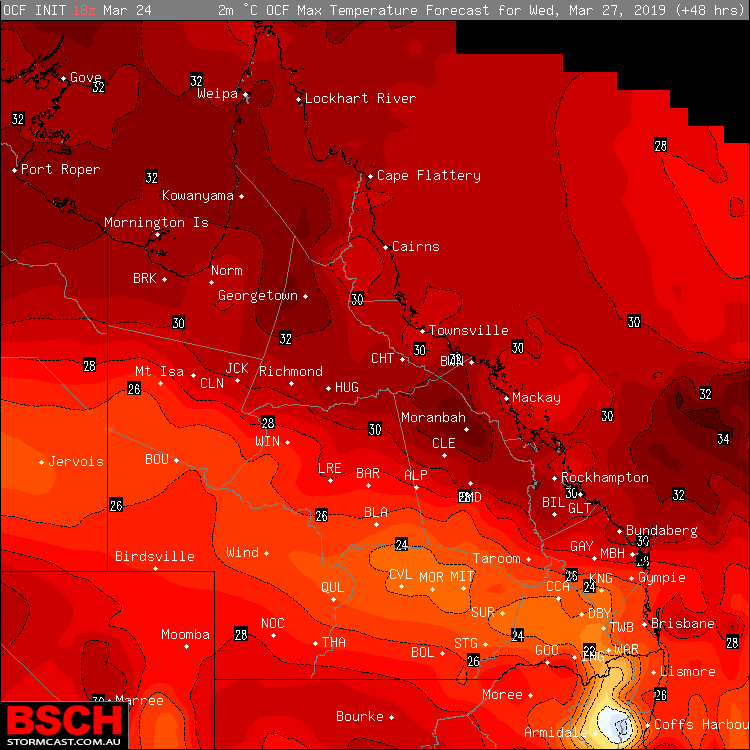 • Brisbane’s March record is 38.8ºc set back in 1965, it hasn’t exceeded 35ºc in March in the last 25+ years – Monday will be heading for 36-37ºc. 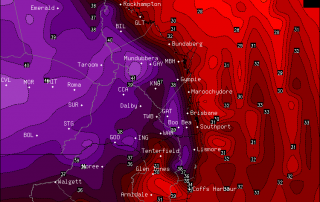 • Ipswich’s March record is 38.9ºc set in 2007 – Monday is heading for 39, possibly even 40ºc! • Warwick’s record is 37.2ºc set in 1998 – Monday and Tuesday are expected to exceed 36ºc. 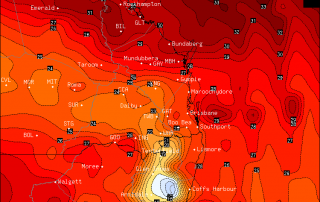 The good news for some, will be that this heat and humidity won’t be for nothing – some storms are expected each day across parts South East QLD. Many places will miss out, but for those who are lucky enough to receive a good storm – then some good rain is on offer as well as some momentary relief from the heat. Just like the good old days. We have to stress though, that some people WILL miss out. Its not the perfect storm setup! For storm forecast details click HERE. From that small sample of locations, you can see that while March has historically had its moments of high end heating, theres a fair chance this will exceed those moments. Even though its been a fairly hot Summer across the region, and more so dry, with heat streaks broken left right and centre, its still a time to be weary of those who are susceptible to heat exhaustion. The elderly, pregnant woman and kids are the most at risk of heatstroke and heat related illness, as well as pets. Given this heat is happening over week days, it would be advised to pack some iced water or have some cool packs in your kids lunches and maybe even supply them with some sunscreen. 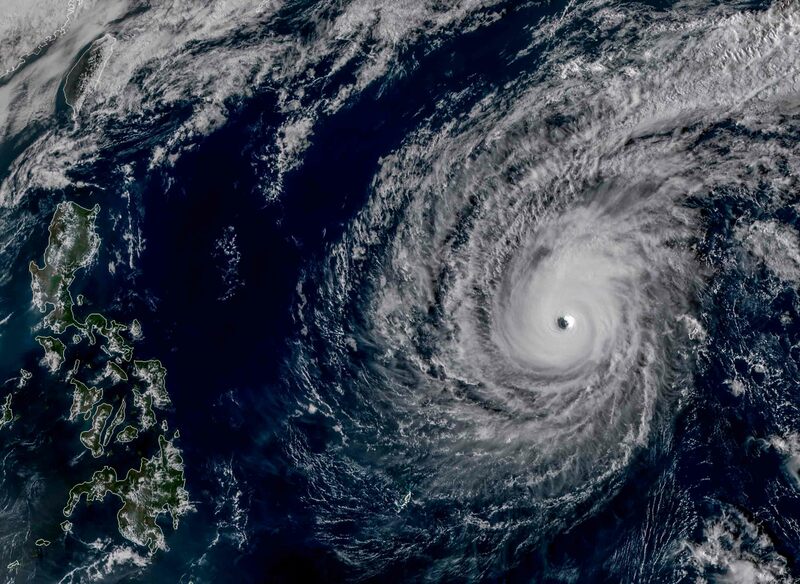 Super Typhoon Wutip – The Strongest February Typhoon In History! 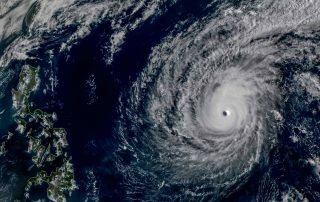 Super Typhoon Wutip has made history today, becoming the strongest typhoon in recorded history through the month of February. Thankfully it has achieved such a feat over open waters. Above image via RAMMB / CIRA. 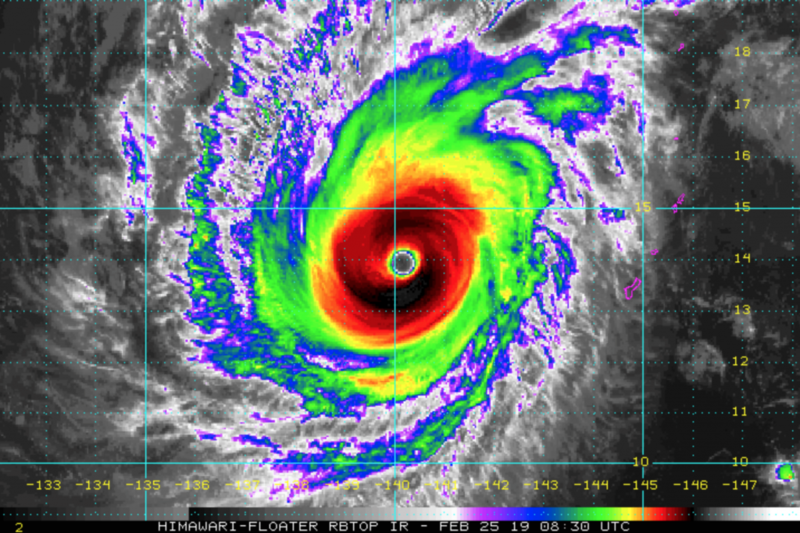 Wutip has achieved history, becoming a Super Typhoon during Monday, February 25th 2019. The system is producing sustained winds of around 260km/h and wind gusts to well over 300km/h which makes it comfortably a Category 5 system but also, more importantly for history reasons, the strongest typhoon (not cyclone – specifically typhoon) for February. Such a feat has been achieved due to the fact February is virtually the complete opposite month for a typical typhoon season. To put it into perspective, this would be like Australia getting a system stronger than Cyclone Yasi in July. For now, Wutip is remaining over open waters and not really bugging anyone – located well North of Yap and well West of Guam. The system has a perfectly symmetrical eye wall feature which is conducive of your typical Super Typhoon. Models are in full agreement that over the next 3 days, the system is expected to be very slow moving over favourable waters. This will at least maintain the system’s strength for a short period of time. 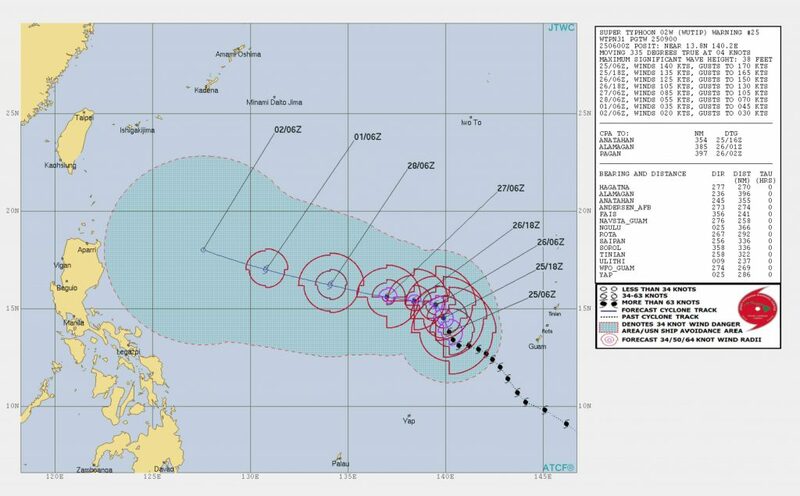 Beyond the next 3 days there is a general agreement that the system will move towards either the Northern Philippines or Southern Taiwan. The good news is models are in full agreement that whatever path the system takes from Wednesday or Thursday onwards, it will enter very unfavourable much cooler waters and increased vertical wind shear which will rapidly weaken the system. Its likely to weaken so quickly that it may not even reach land as a circulation, but completely wash out. This makes it perfect for weather lovers, weather chasers and general enthusiasts alike to admire what is simply a perfect storm in the most unlikely of situations.